My Dad was turning 70 but would not like the fuss of a party. We knew we had to do something so we sent out fliers with the following to his relatives, friends, neighbors, coworkers, old neighbors etc. 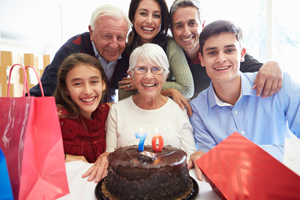 Your uncle, or neighbor, or friend who's our Dad is about to turn 70 and he's not too glad. We can't have a party for it would cause tension no matter how honorable was our intention. So we're having a card party and your card's invited (No people are coming - so please don't feel slighted) A card with good wishes that's sent to his kin will be presented on his birthday and then we'll all win. We're hoping to give him a pile so tall -- He'll have to feel good when he opens them all. So please don't delay or you might miss the date. We appreciate your help to make Dad feel great! e was so touched. He heard from people he hadn't seen in years and got sweet notes and pictures from many. It was the best! I was proud of my little poem and would be glad for others to use it.